Book 3 of The Husband Hunter’s Guide to London series Coming March 2019. Just weeks from her twenty-ninth birthday, Emily Radstock, unmarried daughter of the Earl of Candover, receives from her mother a little blue advice book, The Husband Hunter’s Guide to London. Outraged at her mother’s attempt to push her out of the nest, Emily declares she’ll marry the first imbecile she meets. Overhearing the beautiful heiress declare her intention, Baronet Sir Ajax Lynley, newest gentleman spy in the Pantheon Club, takes her at her word. 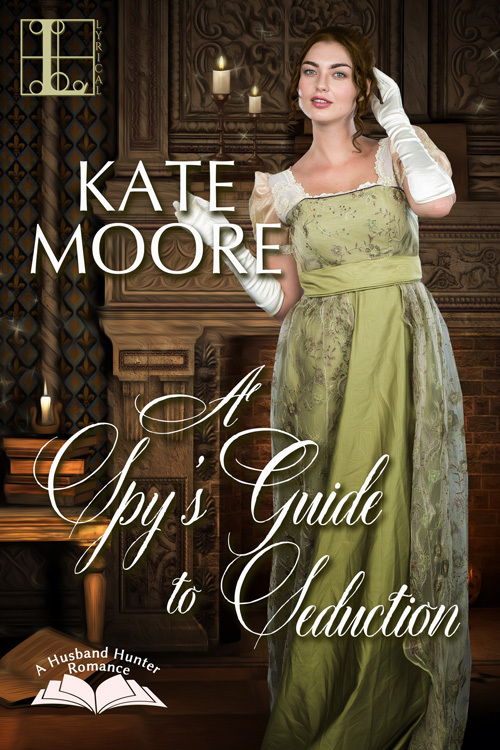 From the moment their engagement begins, Emily finds herself more and more intrigued by her fiancé, a man who encourages her daring and who offers a most seductive partnership in spy-catching. His engagement to Emily offers Lynley, an outsider in the London, the perfect cover as he seeks a member of fashionable society with stolen Foreign Office papers that could plunge England into war with Russia. Lynley never intends seduction, but only his kisses can stop Emily’s busy brain. Mounting danger and an uncanny echo of his painful past lead Lynley to abandon the partnership and go alone to catch the thief. Emily has to put aside the hurt and humiliation of a missing fiancé to save her partner in spying and seduction.